The earliest porcelain figures were made for the dessert course of grand dinners and replaced the sugar paste and wax figures made since medieval times for royal feasts. Originally intended as expressions of dynastic power and to celebrate political allegiances, allegorical themes had been introduced into these table settings by the 16th century. By the 18th century many were entirely decorative. A convention for depicting the Four Continents as female figures was used as early as the Counter-Reformation to symbolise the worldwide spread of Catholic Christendom. The figures were given wider appeal through their inclusion in the Iconologia of Cesare Ripa, an illustrated book of emblems widely used by artists from the early 17th century. ‘Africa’ was conventionally depicted as a black woman with ‘an Elephant’s Head for her Crest; a Necklace of Coral; and Pendents [sic] of the same, at her Ears; a Scorpion in her right Hand, and a Cornucopia, with Ears of Corn, in her left; a fierce Lion by her, on one Side, and a Viper and Serpent on the other.’ Here ‘Africa’ takes the form of a black child. 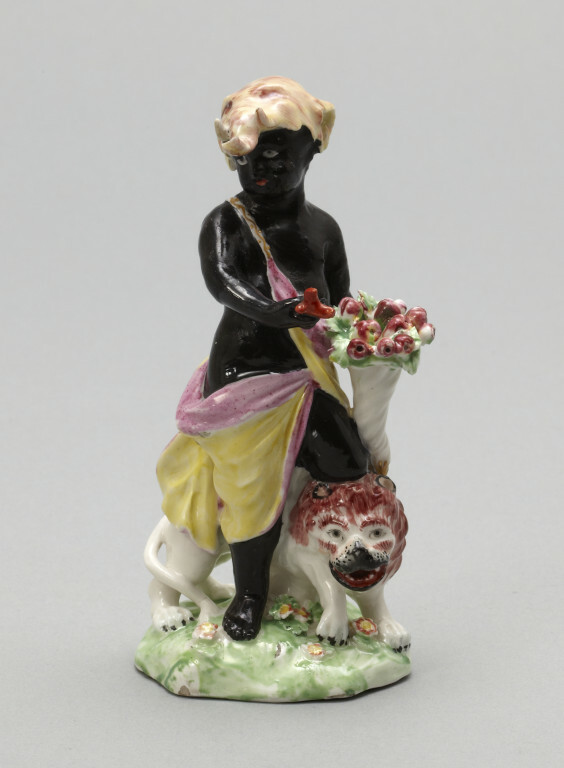 Figure of a black boy in soft-paste porcelain painted in enamels and gilded, standing with one knee resting on a lion, emblematic of Africa. In his left hand he holds a cornucopia of fruit, in his right a piece of red coral. He wears a pink and yellow drape around his waist and an elephant's head on top of his head. Base decorated with flowers. Figure of black boy in soft-paste porcelain representing 'Africa', made by Derby Porcelain Factory, ca. 1785-1790.